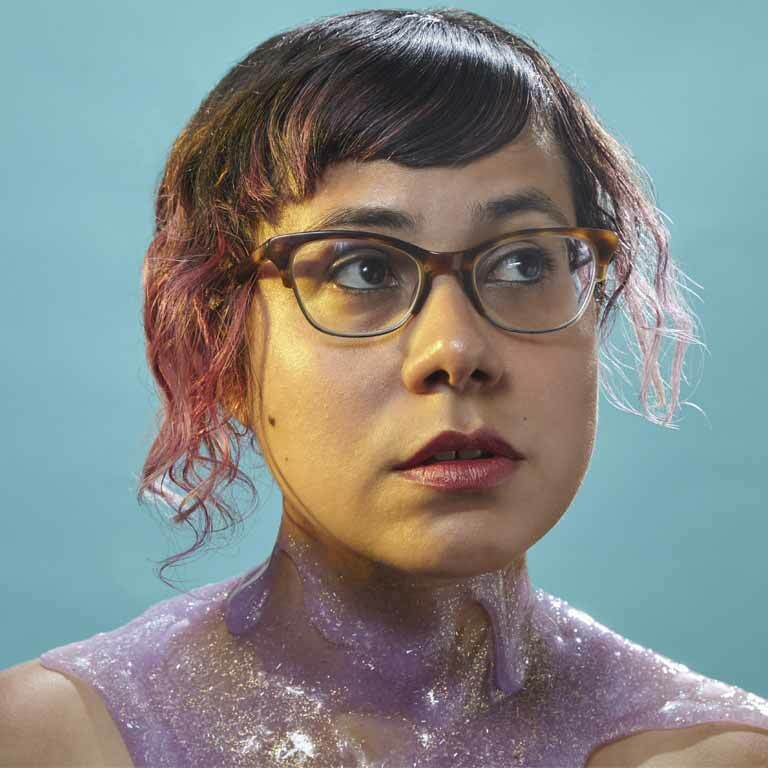 Composer and multi-instrumentalist Angélica Negrón was born in San Juan, Puerto Rico in 1981 and is currently based in Brooklyn, New York. Interested in creating intricate yet simple narratives that evoke intangible moments in time, she writes music for accordions, robotic instruments, toys and electronics as well as chamber ensembles and orchestras. Her music has been described as “wistfully idiosyncratic and contemplative” (WQXR/Q2) and “mesmerizing and affecting” (Feast of Music) while The New York Times noted her “capacity to surprise” and her “quirky approach to scoring”. She was recently selected by Q2 and NPR listeners as part of “The Mix: 100 Composers Under 40” and by Flavorpill as one of the “10 Young Female Composers You Should Know”. Angélica has been commissioned by MATA Festival, the 2016 New York Philharmonic Biennial, the Albany Symphony and loadbang and she has curated concerts for El Museo del Barrio (Composers Now Festival), MATA Interval Series and Pregones Theater. Her music has been performed at the Bang on a Can Marathon, the Look and Listen Festival and the Ecstatic Music Festival and she has collaborated with artists like Sō Percussion, TRANSIT Ensemble, Choral Chameleon, janus trio, Cadillac Moon Ensemble, Cantori NY, Face the Music, Iktus Percussion Quartet, ETHEL, American Composers Orchestra, NYU Symphony Orchestra and the Puerto Rico Symphony Orchestra. She has written music for documentaries, films, theater and modern dance. and frequently collaborates with the experimental theater company from Puerto Rico Y No Había Luz writing music for their plays, which often incorporate puppets, masks and unusual objects. She wrote the score for the documentary “Memories of a Penitent Heart” by director Cecilia Aldarondo which was premiered at the 2016 Tribeca Film Festival and will have its national broadcast premiere on POV in 2017 on PBS. A long time member of the Puerto Rican underground music scene, Angélica is a founding member of the electro-acoustic pop outfit Balún where she sings and plays the accordion and keyboards. With her project Arturo en el Barco she concentrates on working with lo-fi ambient compositions and has released albums on Observatory (Austria) and Carte Postale Records (Belgium). Angélica received an early education in piano and violin at the Conservatory of Music of Puerto Rico where she later studied composition under the guidance of composer Alfonso Fuentes. She holds a master’s degree in music composition from New York University where she studied with Pedro da Silva and is currently a doctoral candidate at The Graduate Center (CUNY), where she studies with Tania León. She has received grants from Meet the Composer (MetLife Creative Connections Program), Foundation for Contemporary Arts (Emergency Grants) and the National Hispanic Foundation for the Arts, among others. Also active as an educator, Angélica is currently working as a teaching artist for New York Philharmonic’s Very Young Composers and Lincoln Center Education and co-founded with Noraliz Ruiz the Spanish immersion music program for young children Acopladitos. She has contributed as a writer to the International Alliance of Women in Music Journal and the British magazine The Wire. Angélica was a composer fellow at the Bang on a Can Summer Festival 2011 and in 2012 was selected as a featured Ableton Live artist. She was the 2014-2015 Van Lier Fellow at American Composers Orchestra and was recently selected as one of the recipients for NYFA’s 2016 Artists’ Fellowship Program. Angélica is currently working on a lip synch opera titled Chimera for drag queen performers and chamber ensemble exploring the ideas of fantasy and illusion as well as the intricacies and complexities of identity. Her music is published by Good Child Music. Thank you to the following funding partners for supporting the Orlando Philharmonic Orchestra’s Composer-in-Residence!